The Birmingham Business Journal and Dale Carnegie of Central Alabama have joined forces to bring a new workshop to the Birmingham Business community. The Power of Storytelling. Because the best story always wins!, will be presented by Dale Carnegie of Central Alabama president, Nancy Covert on June 16. The Birmingham Business Journal and Dale Carnegie of Central Alabama have joined forces to bring a new workshop to the Birmingham Business community. 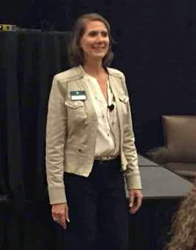 The Power of Storytelling - Because the best story always wins!, will be presented by Dale Carnegie of Central Alabama president, Nancy Covert on June 16. Salespeople are tasked with the responsibility of differentiating themselves from the competition. This is becoming increasingly challenging in today’s crowded market. One often overlooked way to stand out from the crowd is by harnessing the power of storytelling. In this new, half-day seminar from Dale Carnegie Training, salespeople will learn to think outside the box in communications with buyers. Humans are biologically programmed to pay close attention to information in the form of stories, which makes them an especially powerful sales tool. This means they are a great way to capture buyers' attention, boost retention, activate emotions, and increase customer engagement. Participants will learn techniques for creating two types of sales stories and when to use them for maximum impact. Attendees will refine the content of their stories, practicing the delivery with confidence and bringing mundane facts and figures to life. They’ll learn where to find content ideas for their sales story, and will begin to see inspiration every day. About this workshop, Nancy Covert says, "This is a hands-on seminar that guides you from start to finish. You'll be able to engage buyers in a unique and unexpected way." Participants will leave with practices they can put in place immediately. This program is designed for sales people who practice consultative selling and want to become more persuasive, capture buyers' attention, boost retention and increase customer engagement. Storytelling is an essential tool in the selling process and is particularly useful to experienced sales professionals who need to create more credibility with their clients. Dale Carnegie Training has been helping individuals and organizations achieve their goals for 103 years. We are an action company. We focus on learning through doing, and apply time-tested techniques for real-world and real-life results. If you’d like to learn more about our programs, please visit http://www.birmingham.dalecarnegie.com or call 205-444-5011.